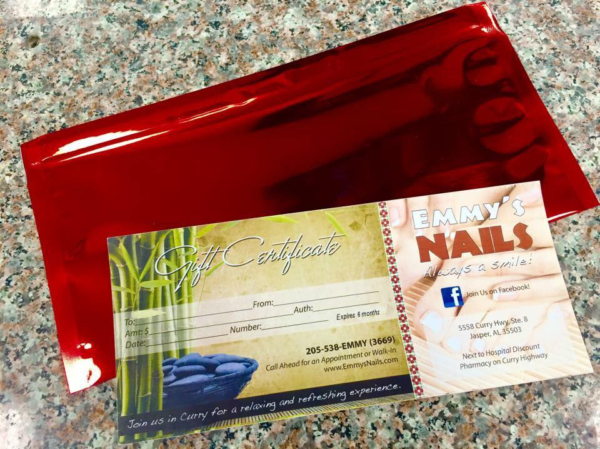 If you’re looking for a gift that is sure to please, you can’t go wrong with a gift certificate or shop credit from Emmy’s Nails! You know they’ll love it! Christmas, Valentine’s Day, Mother’s Day, Birthdays, Showers/Wedding Gift, Closing Gift, or just because you love her! For your convenience, you can either reserve a Gift Certificate to be picked up or you can just stock up some shop credit for your loved one(s). Just let them know to come use it! Comes with a gold or red foil envelope. Color depends on our current stock. Learn more about Emmy’s Nails in Curry.